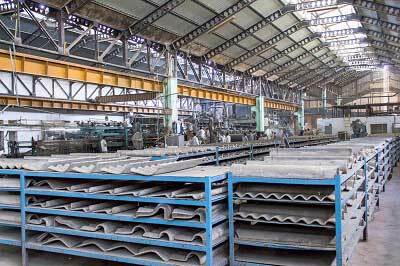 UP Asbestos Limited (UPAL) is one of the Lucknow’s esteemed organizations that has been a part of the UP industrial scenario since 1973. The company has maintained a listed status since 1976. More recently UPAL has ventured into the marketing of new products such as Coloured Profile Steel Sheets, Electrical Cables, Paints and Allied Products. These products are manufactured by UPAL’s trustworthy suppliers. Stringent tests are conducted at the head office in the newly created testing lab where all batches of products dispatched by the manufacturers are tested in order to ensure high quality. UPAL has currently undertaken a solar installation project at its manufacturing unit in Lucknow and is working towards becoming a greener company. It is also currently in the process of complete automation of its manufacturing unit thereby announcing significant growth in its manufacturing output of sheets. UPAL demonstrates high standards of corporate social responsibility by constantly assisting its surrounding villages. As a recent CSR initiative, UPAL has contributed towards building a check dam in Jhansi, UP.